One source of great joy for us here in California has been hunting down the nooks and corners particularly loved by the friends kind enough to follow these reports of our trip. I hope to write more about how these recommendations have added interest and warmth to our time here, but for now I will simply say that when Clarice from "The Storybook Woods" urges you to try a place, be prepared to step directly inside a fairy tale. Back in early July, Clarice wrote to me about a little town just over a hundred miles south of San Francisco called Carmel-by-the-Sea and an English Tearoom with the charming name, "The Tuck Box." I kept this in the back of my mind for all these weeks, and this past Sunday, I found myself sitting inside a vintage cottage, inspired in its construction by the watercolors of Arthur Rackham, ordering Tea with my girls. The menu at the Tuck Box offered authentic English fare, and I sat down to some of the best Shepherd's Pie ever assembled--second only to the delicious meal my Irish friend Caroline always totes to our house at the arrival of each new baby. The cast of our recent production of a Midsummer Night's Dream will confirm that the girls and I are ardent admirers of Arthur Rackham's artwork, so an afternoon spent inside one of his paintings was a dream come true. Builder Hugh Comstock created dozens of these graceful structures decades ago, giving the little town of Carmel-by-the-Sea its idyllic feel. 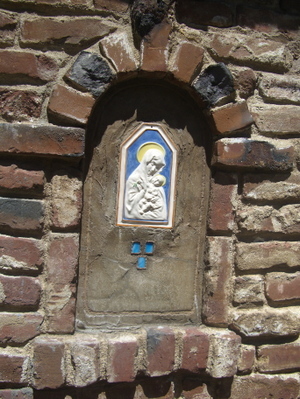 On the side of The Tuck Box, I was beside myself to find a built in Madonna and Child tile and wonder if all Comstock Cottages have similar touches. 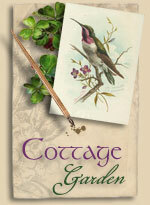 My hope is that someday, my own dear cottage in New York will wear one just like it. Long before Hugh Comstock ornamented this fairy tale village, it was the favorite Mission of Blessed Junipero Serra. 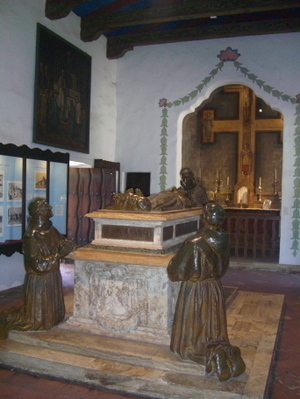 Shortly after tea, we had the happiness to wander the Carmel Mission of San Carlos Borromeo, saying a prayer by the grave of Blessed Serra himself. It is a holy place--a paradise within a paradise--awash in flowers and saints' statues and whispers of the past. We have visited four missions during our time in California, but I, like Father Serra himself, will always call Carmel my favorite. There have been rare occasions in my life in which I have stood in a distant place and felt as if I had just returned home--it always happens to me in Ireland, for instance. I had this same feeling standing in the Mission Garden, listening to bees buzzing in and out the wall of the basilica, catching the glint of abalone shells, and lingering near the well tended shrine to Our Lady. 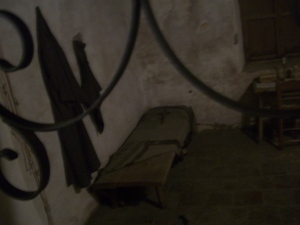 Stopping for a moment, I offered a prayer of thanksgiving for the Spanish missionaries, the canonization of Blessed Junipero Serra, and the many good souls lying at rest in that bower of blessedness. Many thanks to Martha Long, who also recommended The Tuck Box the moment she heard we were in Carmel! Alice, thank you! 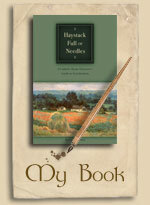 But from everything I have read and seen on your blog it was obvious that you would love Carmel and the Tuck Box. As a long-displaced Californian (living in Virginia for far too long! ), my favorite mission will always be Carmel too. (One of my sisters was even married there.) Your reports of your trip have been wonderful and have made this San Franciscan feel as if she were with you and your beautiful family. 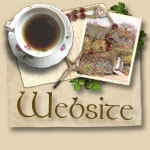 The Tuck Box looks enchanting! I'm so glad you enjoyed your visit. Ooooh, I think I want to spend my life in Carmel-by-the-Sea. I remember seeing The Tuck Box on Food Network awhile back. Thanks, Alice, for another shared (if only we could *really* share it) adventure. What a lovely day to share with us! 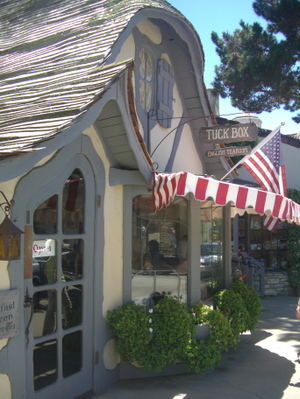 The Tuck Box and Carmel-by-the-Sea look so enchanting. I too wish we could *really* share in this adventure. Lovely, Alice...Steve and I attended Mass at that Mission during our engagement! I used to live near that area. However, I only have one memory: My mother was driving my sister and I to Carmel and she had told us where we were going. My sister misunderstood. She was a little upset when we arrived because she thought we were going to get "Chewy-Chewy Carmel"! Anyone remember the candy bar commercial for $100,000 bar? I think I'd like to return now and look at it this way too. Thank you for sharing this! What an interesting place. I'm so glad you were able to visit and then share it here with us. Thank you for sharing. How fortunate you are to visit all of these beautiful holy places way across the country. It sounds like a beautiful weekend. 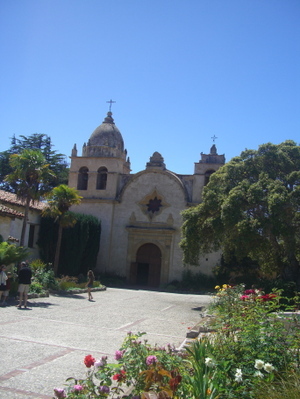 I have been to all the California Missions. I love them. Actually, I have been to most of the New Mexico ones and the ones in Arizona too. I love the Carmel one, especially the window. The inspiration for the gate I designed for my courtyard was based on that window. I don't think I have a favorite mission most of them are very beautiful. How beautiful! Thank you for sharing this. I have to visit the Tuck Box someday. I am so thrilled for you family Alice to have been blessed with such a wonderful opportunity to take in all the incredible San Francisco sights! 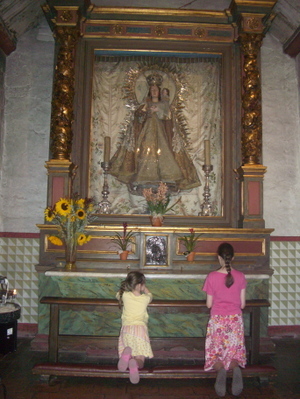 In California, public education includes coverage of the twenty-one Missions; to my knowledge, Father Serra did not have a favorite, although Santa Barbara is referred to as the Queen of the Missions, for obvious reasons. Carmel is a trap for tourists, and no longer has the sohistication of the original founders (a group of artists), but it does have some charms, such as the (Italian) Della Robia tile, pictured here.